syrupy consistency, remove from heat and stir in 1 tbsp. butter. 2. Spread jam thinly onto pan and place in refrigerator to cool. in egg and vanilla, continue to mix for 1-2 minutes longer. Turn mixer to slow speed and slowly add in dry ingredients. 4. Mix only until incorporated. Remove dough from mixing bowl and wrap in plastic, place in fridge for 30-45 minutes. middle-cut out. 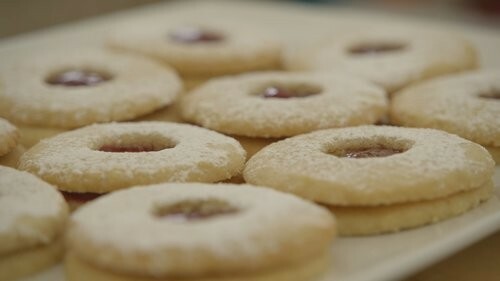 Remove surrounding excess dough, and the middle portions of the cookies, and re-roll to create more cookies. 7. Once sheet is full, place in pre-heated oven and bake for 6-8min, or until firm but still pale. Remove and place on cooling racks. 8. Once cooled, Take the top half of cookies (the ones with holes in them) and dust with powdered sugar. 9. Next, remove jam from the fridge. Place 3/4 teaspoon jam on the full half of the cook, spreading to thinness. Then top the jam with the other half of the cookie (thepowdered sugar half). 2. Remove dough from mixing bowl and wrap in plastic, place in fridge for 30-45 minutes. and add different food colorings as necessary. 4. Once mixed, place icings into piping bags fitted with Ateco Decorating Tip 2. 6. Place rolled dough onto baking sheet lined with parchment paper, then use cookie cutter to make shape. 8. Decorate cookie time! 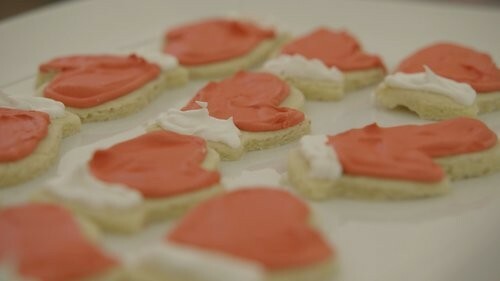 For the sugar cookies, carefully decorate using royal icing.